Protect your expensive headlamps, before it's too late! Introducing LampGard, an incredibly tough 40 mil. thick, double-polished urethane material that is optically clear and applies (peel & stick) directly to the surface. This product has built-in ultraviolet inhibitors that help prevent the material from drying, hardening or discoloring. We custom die-cut to fit your specific vehicle for a precise, perfect fit. LampGard comes with easy-to-follow instructions and applies to headlamps to protect them from scratching, cracking and pitting. Includes guards for both front headlights. With the average cost of replacement head lamps and fog lamps spiraling to nearly $300, it is nice to know that there is a product available to protect your car against the perils of the open road. 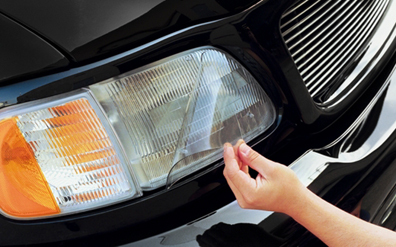 Our Light Protection Products are made from a proprietary, scratch-resistant, urethane material coupled with the strongest optically clear adhesive available. Designed for maximum durability, our light covers were originally tested under the harshest of circumstances with amazing results. Both in the real world and in the lab, our covers have proven that they will withstand a barrage of 1" diameter stones (about 1oz.) at speeds up to 120 m.p.h. with no damage to the lens they protect. It is nice to know that your expensive lenses are protected in every scenario. We are so confident in our product that we offer a 7-year warranty to leave you with complete peace of mind. Usually ships by the next business day. Please allow an additional 1 - 5 business days for delivery to most US locations.